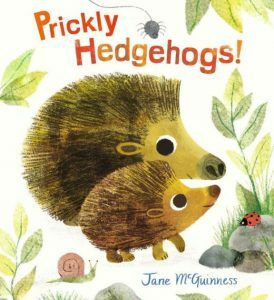 PreS-Gr 3 –In this charming British import, McGuinness presents an introductory tale about a hedgehog and her hoglets, one of which takes center stage as he grows and learns to be independent. MCGUINNESS, Jane. Prickly Hedgehogs! illus. by Jane McGuinness. 32p. further reading. index. Candlewick. Mar. 2018. Tr $16.99. ISBN 9780763698805. PreS-Gr 3 –In this charming British import, McGuinness presents an introductory tale about a hedgehog and her hoglets, one of which takes center stage as he grows and learns to be independent. The main narrative communicates information with ease and makes light use of onomatopoeia (“Do you hear that? Listen. Someone’s sniffling and snuffling and snaffling…whirring and churring and purring…Someone small and prickly.”). In addition, a rich scattering of short, factual notes in tiny yet readable print provides deeper information on most pages. Despite the brevity of the text, the author manages to cover the hedgehog’s appearance, self-protection from predators, nesting habits, care of young, favorite foods, personality traits, and preparation for winter hibernation. A “More about Hedgehogs” page, a short index of terms used in the text, and further reading are all pleasant add-ons. McGuinness’s talent shines in her mixed media artwork. The combination of the delightful large-eyed cartoon hedgehogs, appealing mix of verdant and autumnal colors, and variety of spread, spot, and panel art add to the winning presentation. VERDICT A truly enjoyable read-aloud on a fascinating topic for early elementary classrooms.–Susan Scheps, formerly at Shaker Public Library, OH This review was published in the School Library Journal March 2018 issue.